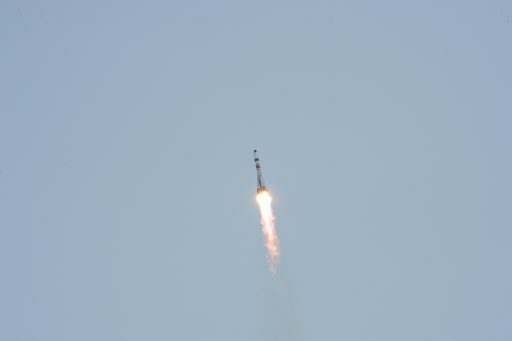 Soyuz 2-1A making its return to flight mission with the Progress spacecraft lifted off from Site 31/6 at the Baikonur Cosmodrome at 8:44:39 UTC on Monday. 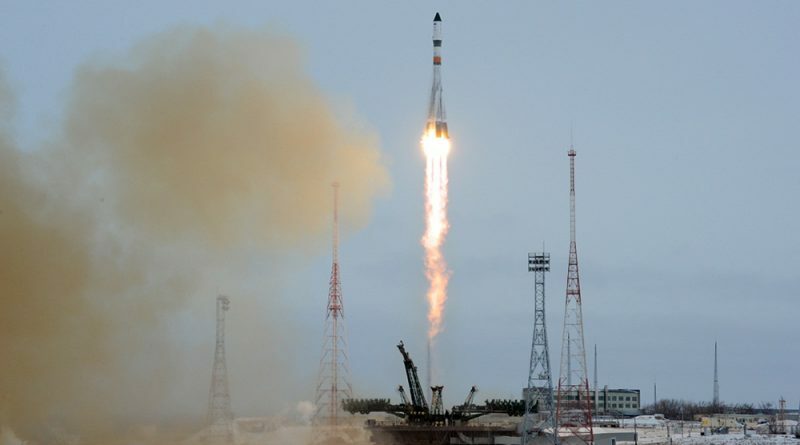 With a thrust of 422 metric-ton-force, Soyuz climbed vertically for a few seconds before pitching and rolling onto the typical north-easterly departure trajectory, headed for a 51.6° orbit. The four boosters burned four nearly two minutes, consuming over 39,000 Kilograms of propellants each to send the Soyuz on its way. After a clean booster separation, Soyuz continued firing its Core Stage until T+4 minutes and 46 seconds when the RD-108A engine was shut down after burning more than 90 metric tons of propellants. 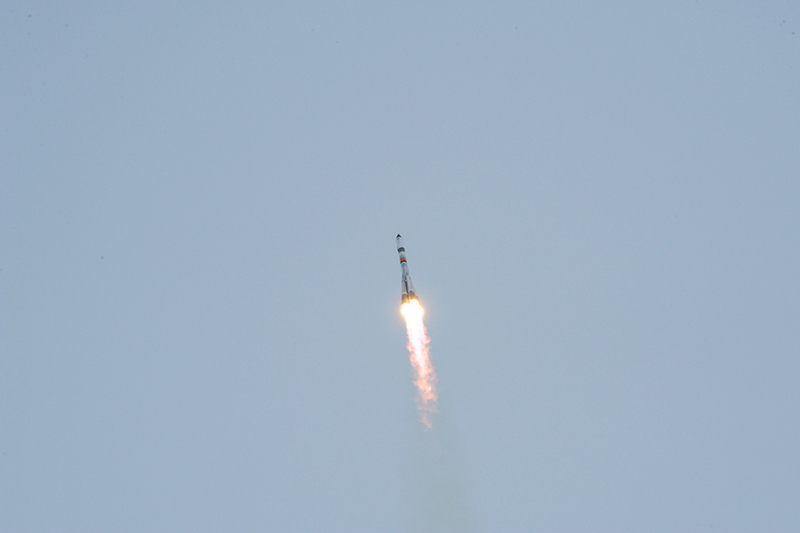 Immediately after Core Stage Shutdown, the RD-0110 engine on the third stage fired up and the pyrotechnic stage separation system was initiated. The third stage was in operation for three minutes and 58 seconds, successfully placing the stack into orbit. Spacecraft separation occurred eight minutes and 48 seconds after launch and was clean, showing that the smoother shutdown sequence on the engine – tweaked by just 0.3 seconds – solved problem encountered on the Progress M-27M mission in April when the sudden shutdown of the engine induced oscillations at the natural resonance frequency of the Block I – Progress stack leading to the destruction of the tank structure and improper separation of the spacecraft. These orbital parameters are well within the given limits and will allow the Progress to conduct its two-day rendezvous with ISS without any significant changes to the flight profile. Progress MS will be tasked with two main engine burns on its third orbit around Earth to reach a 256 by 305-Kilometer orbit in which it will remain until Tuesday morning when a third DV maneuver will be made to fine-tune the orbit of the vehicle, set to initiate its rendezvous with ISS on Wednesday morning. The Progress spacecraft uses a KTDU-80 propulsion module featuring the main propulsion system. It includes four spherical tanks that can hold up to 880 Kilograms of UMDH and N2O4 propellants. The S5.80 main engine can operate at three thrust levels. Progress MS will begin its fully automated rendezvous at 8:10 UTC on Wednesday, making another pair of DV burns to reach the 200-Kilometer communications zone around ISS at which point the KURS system of Progress will be powered up to acquire signals sent by its counterpart on ISS. Entering the relative navigation phase of the rendezvous, Progress will use data provided by KURS to guide itself to a a point one Kilometer from ISS through a series of propulsive maneuvers. At a range of 15 Kilometers, Progress will complete a KURS test to make sure navigation data provided by the system is valid. The TORU System will also be active and in standby mode. 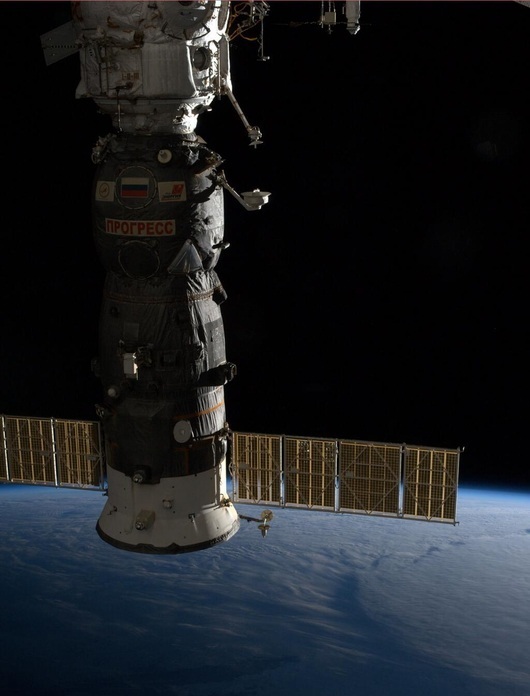 The Russian crew members aboard ISS will be supporting the Rendezvous and Docking by monitoring the vehicle and acquiring engineering footage. They will be standing by at the TORU Controls to assume manual control over the spacecraft should a problem with its navigation system occur. Inside 1 Kilometer to ISS, Progress will conduct a series of braking burns with the DPO thrusters of the vehicle to slow down ahead of the Flyaround that is initiated at a distance of 400 meters. The slow lap around the orbiting outpost will line the Progress up with the Pirs docking compartment at a distance of about 200 meters for a short period of Stationkeeping before committing the craft to final approach. Covering the final meters to Pirs, Progress prepare its docking mechanism for contact. 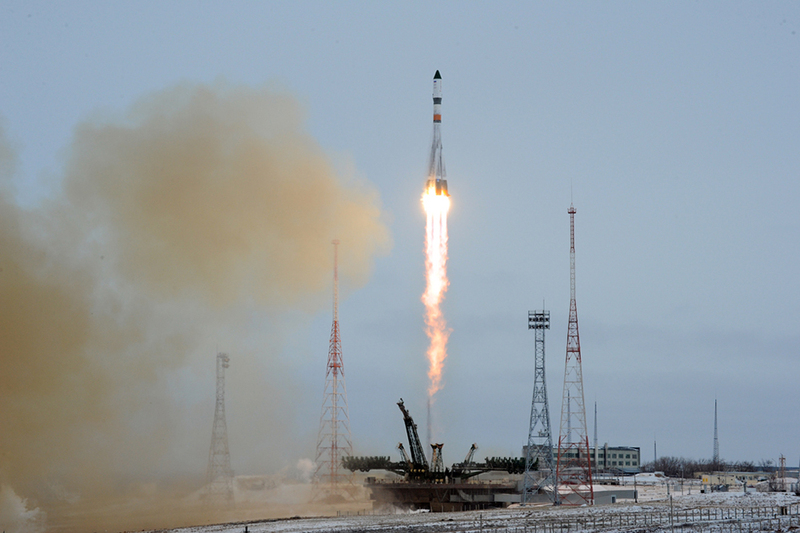 Contact and Capture is expected at 10:31 UTC on Wednesday to mark the start of a seven-and-a-half-month stay and the delivery of 2,350 Kilograms of cargo.